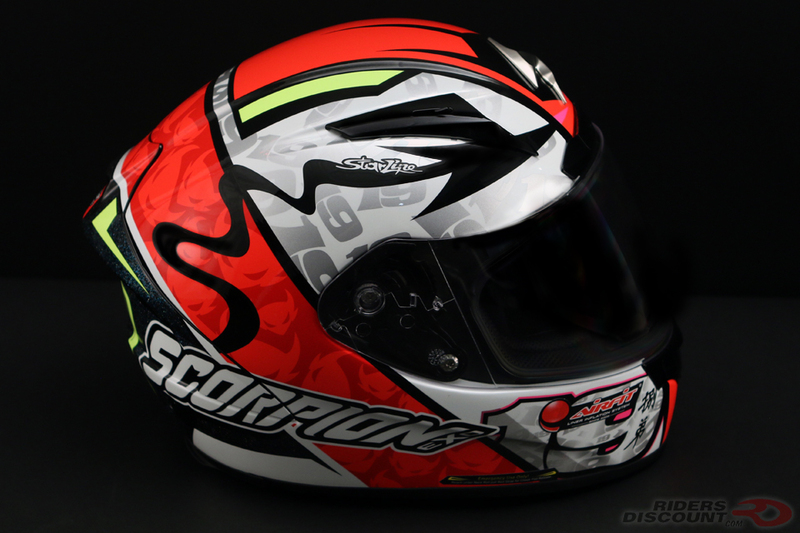 The EXO-R2000 is the top of the race helmet line at Scorpion. 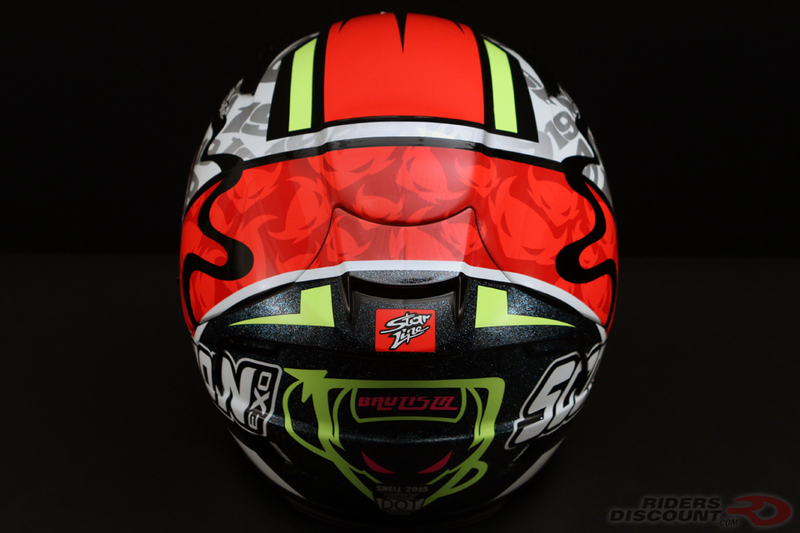 Now it’s available in MotoGP rider Álvaro Bautista’s graphic. 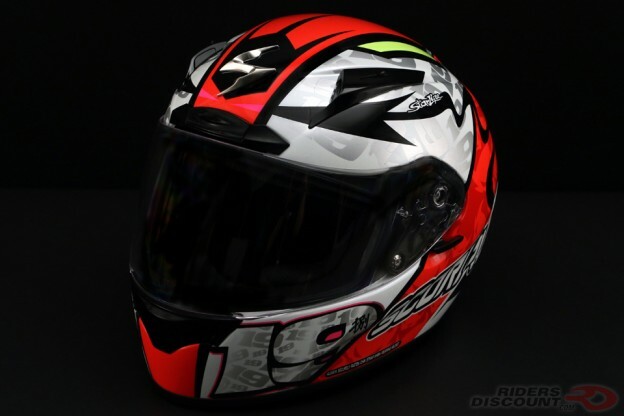 The Scorpion EXO-R2000 Bautista Helmet has Álvaro’s number 19 on both sides of the chin, as well as patterned throughout the helmet. 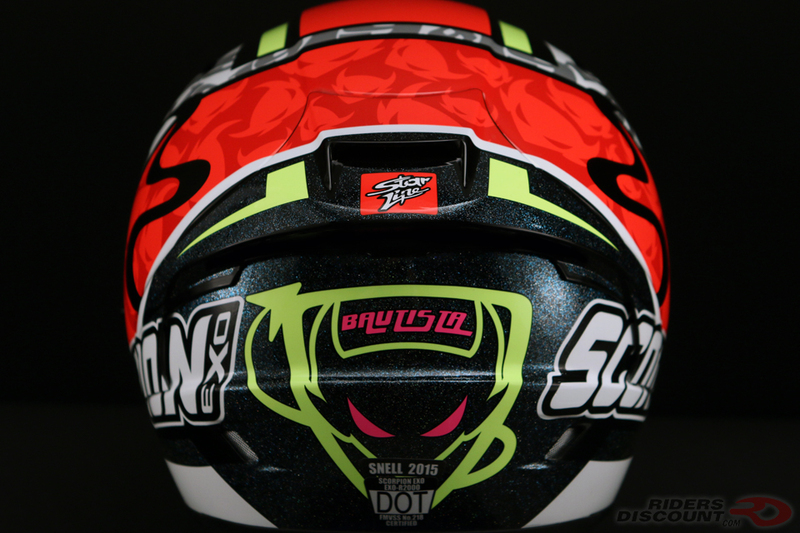 The back features a black glitter background with Bautista’s demon logo in the center. 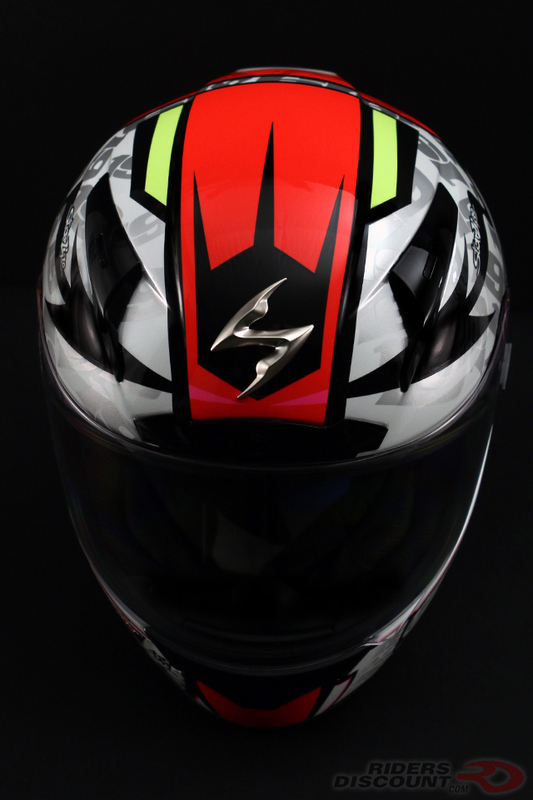 A red stripe with a demon logo pattern inside wraps around the helmet. The TCT Composite Shell of the EXO-R2000 is made with a 5-layer blend of fiberglass, Aramid and organic poly-resin fibers. Six intake and ten exhaust vents work together to ensure comfortable airflow and heat removal. 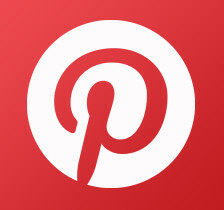 The “Elip-Tec” ratchet system makes removing the shield easy, no tools needed. This helmet includes both a clear and dark smoke shield. 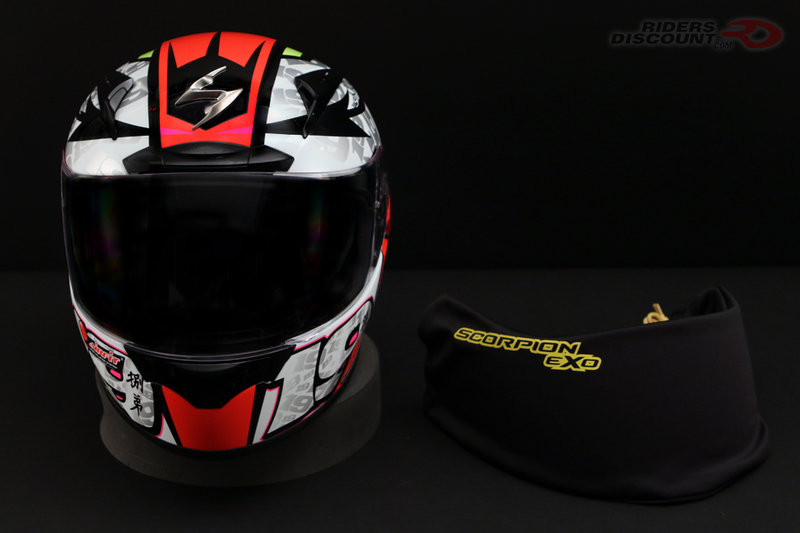 Inside of the helmet is Scorpion’s “KwikWick III” cheek pads and comfort liner. The material is moisture-wicking, breathable, and anti-microbial. The EXO-R2000 comes equipped with the “AirFit” system, which allows you to customize the fit via air adjustable cheek pads. 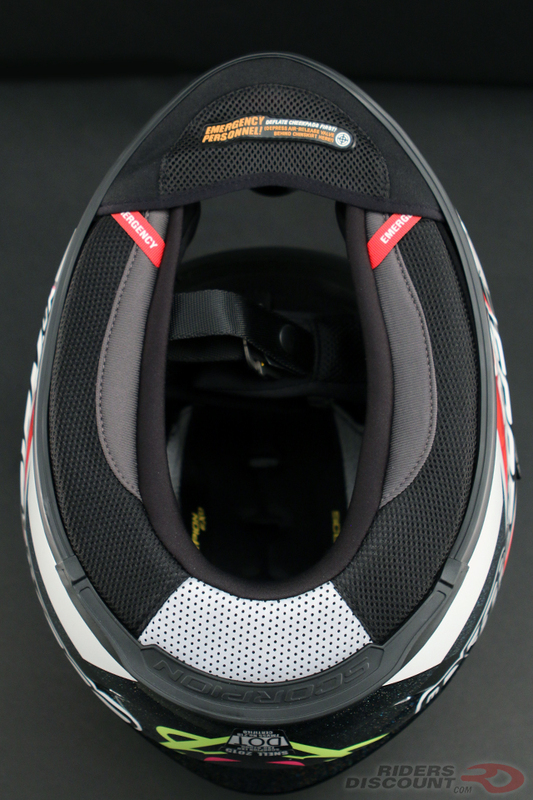 The interior of this helmet is completely removable and washable. 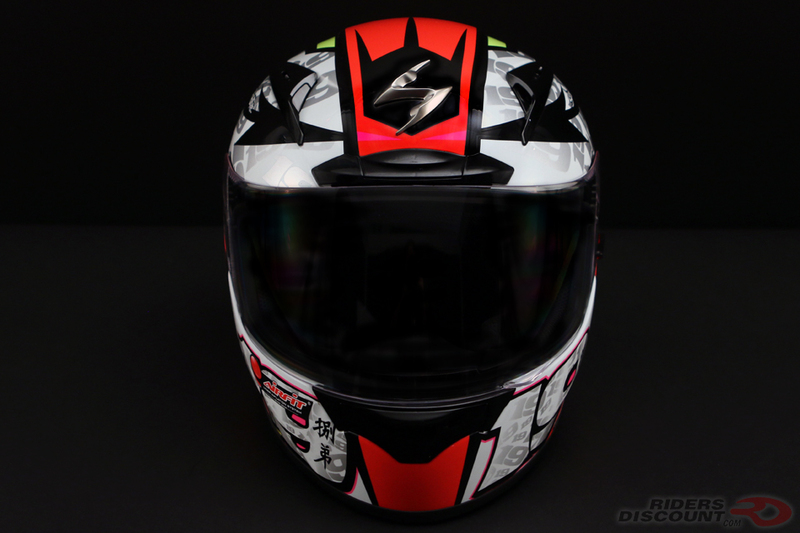 This entry was posted in News, Product Reviews and tagged Álvaro Bautista, Bautista Helmet, EXO-R2000, MotoGP, Motorcycle Helmet, race helmet, Riders Discount, Scorpion, Scorpion EXO-R2000, Scorpion EXO-R2000 Bautista Helmet on April 7, 2017 by Riders Discount.